A beautiful smile isn’t just healthy, but also able to function properly thanks to symmetrical teeth alignment. When your teeth are crooked, the effects can impact your smile’s appearance as well as how your bite functions. For patients with tooth misalignment (or malocclusion), the traditional solution is typically to correct the misalignment with orthodontic braces. 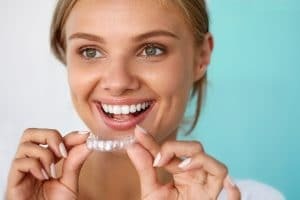 However, for older teen and adult patients who wish for a more comfortable and discreet alternative to braces, we can often recommend Invisalign®, which straightens teeth using virtually invisible aligners rather than conventional bracket-and-wire braces. After careful dental examination, your dentist can help you determine if Invisalign® aligners can help you enjoy a straighter smile. Invisalign® is a system of custom-designed aligners, made from clear, BPA-free plastic. The aligners are designed to gently guide crooked teeth into straighter positions as you progress through each one. Besides being nearly invisible, Invisalign® aligners are temporarily removable, which means you can brush and floss your teeth without needing additional products to clean around brackets and wires. You can also remove your braces before eating, eliminating the need to choose only foods that won’t stick in your braces. When adults choose to straighten their teeth, it’s often for cosmetic reasons and the desire for a more attractive smile. In light of that desire, traditional metal braces can seem conspicuous, and patients may choose not to wear them out of fear of embarrassment. With Invisalign®, you can achieve the same teeth-straightening results without worrying about your treatment being obvious, and without having to make drastic accommodations to your hygiene and eating routines. Just because your teeth are crooked doesn’t mean that you have to endure braces, especially if you qualify for Invisalign® clear aligners. To learn more about the benefits, schedule a consultation by calling Smith Family Dentistry in Greenville, TX, today at 903-455-5750. We proudly serve patients from Hunt County, Greenville, Royce City, Sulphur Springs, and all surrounding communities.